Chikmagalur: While most of Karnataka is going dry and the Cauvery remains embroiled in a dispute, hope is emerging from Vedavathi river basins in Chikmagalur, Hassan, and Chitradurga. The water landscape of the three districts has been changing with The Art of Living’s Vedavathi River Rejuvenation Project. Gurudev Sri Sri Ravi Shankar Wednesday visited the sites in and around Chikmagalur. He met and shared the joy of the farmers and village folk who have already started benefiting from the ongoing project, which began in 2013. Gurudev applauded the project coordinators and volunteers who have worked to build a network of 6,786 recharge structures while ensuring community participation. communities in Chikmagalur, Chitradurga, and Hassan. explained that the rejuvenation process is the result of thorough scientific planning. persons in Chikmagalur. “To resolve the Cauvery dispute, we should rejuvenate rivers in Tamil Nadu and that’s why we have taken this river rejuvenation technology to Tamil Nadu,” he added. Nadu and results have started coming in. for the completion of the project, which is expected to benefit 15 lakh people. During the visit, he led the ‘Water Warriors March’ in Chikmagalur which was joined by MLAs, farmers, and volunteers. The March ended with everyone present taking an oath to stop polluting water resources, to optimally utilize water, to plant trees and harvest rain Water. 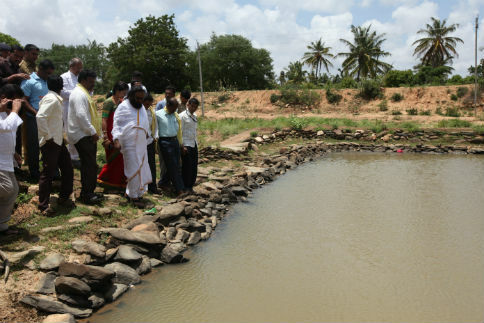 After his visit to Vedavathi basin, Gurudev will inspect and review Kumudavathi river rejuvenation work on Thursday. The Art of Living is currently working on reviving 30 rivers across India.